U.S. gross domestic product increased at a brisk 3.3% annual pace in the April-June quarter, according to the Commerce Department. That was the best showing since the third quarter of 2007, beating the government's earlier estimates of a 1.9% growth rate and topping economists' forecasts of 2.7%. Exports grew at a 13.2% rate in the quarter, more than double the first-quarter rate. Consumer spending rose 1.7%, the biggest increase in nearly a year, as government rebate checks of as much as $600 per person sent shoppers scurrying to malls and big-box retailers. However, some economists questioned whether those factors could sustain economic growth through the second half of the year and into 2009. The GDP report also showed that businesses cut investments in equipment and software by 3.2%, more than in the first quarter, and investment by home builders fell 15%, although this was an improvement over the first-quarter drop of 25%. After-tax corporate profits, meanwhile, fell 3.8% in the second quarter after increasing 1.1% in the first three months of the year. MSNBC’s article is less realistic, though the subtitle does back off from actually calling a bottom. The recovery in the housing market is being slowed by the availability of credit, now that lenders have substantially tightened up guidelines on approving loans. The supply of mortgage money has also been crimped as the two government-sponsored mortgage finance companies, Fannie Mae and Freddie Mac, struggle to cope with mounting losses from foreclosures. Ending the practice of loaning money to completely unqualified people is not what’s slowing the recovery in the housing market. Whatever impediment is in place keeping home prices wildly out of whack compared to everything else, is what will slow the recovery in the housing market. And that includes bailouts. The heavy pace of foreclosures has also been a major force pushing home prices lower, as lenders aggressively price their backlogs of repossessed real estate, hoping to unload them before prices fall further. Once the pace of foreclosures begins leveling off, the pressure on prices will ease. As far as I have seen, the majority of banks have done anything but ‘aggressively price their backlogs of repos’. In fact, relatively few repos are priced to today’s market and even fewer banks can actually move quickly enough to close the deal. However, the ones that do have been rewarded with fast sales. Let’s hope that trend changes. A couple of days ago, Pigginton's San Diego Housing Blog (one of the best and funniest, btw), compared Spain's housing market to Temecula. I think that does a disservice to Temecula. Granted, Temecula has been hurting for a while, but it adjusted far more quickly than anyone expected, and realistic pricing is one of the key factors that will bring a housing market back to life. There are some smoking deals in Temecula right now if you are willing to navigate the short sale swamp. Spain had been among the euro zone's hottest real estate markets but house prices fell for the first time in a decade between April and June as chronic overbuilding and 8-year-high mortgage rates added to the impact of the U.S. credit crunch. "House sales have fallen on a month-on-month basis since the beginning of last year, when the indicator began, and this is just the start," said Merrill Lynch economist Daniel Antonucci. "We expect data to continue to worsen well in to next year." Mortgage lending also plummeted 40.6 percent in June after a 40.4 percent drop in May, as the credit crunch squeezed Spanish banks. Strong economic growth in Spain over the last decade had been supported by surging property and construction markets, though many analysts expect the country to go into recession in the second half of the year as housing demand collapses. "It's awful, as usual," said Stephane Deo, chief economist at UBS. "The housing market is in freefall and this is just another confirmation that this sector is in deep, deep trouble." Ireland's economy has grown in two broad stages in the last 20 years. The first one was a coupling of the country to the very powerful forces of globalisation (eg US multinationals), while the second saw the flourishing of the domestic economy with the tailwind of low interest rates. Where the first phase saw Ireland grow in confidence, the second, arguably, saw it become complacent, uncompetitive and dazzled by its own unexpected success. This is standard behaviour in economies in the full throes of an economic bubble. The biggest mistake policymakers and politicians could make at this stage is to try to prop up the asset bubble in the property market. However, the apparent bewilderment of some politicians in the face of the downturn, and the desire of many of our oligarchs (as expressed in these pages) to see their industries supported by the State, suggests that the short-term crisis and not the long-term future dominates attention spans. I'll be taking a long-planned vacation from August 28th through September 14th, so in my absence I've asked a friend and colleague, Heidi Gothard, to take over primary blogging duties. Heidi's a big fan of blogs in general, so you may see her referencing other blogs as well as the news stories that I've tended to cover. Since I can't help myself, I'll be bringing my laptop in tow to check in periodically, but probably not for posting. With over 15 years of experience as an independent real estate research consultant for residential developers, market research firms and investors, Heidi Gothard has worked on many large-scale projects and master plans throughout the southwestern United States. Prior to joining MetroIntelligence, Heidi worked with other regional consulting firms including MetroStudy, The Meyers Group (now Hanley Wood Market Intelligence), MarketPointe Realty Advisors, Real Estate Economics, and Market Profiles as well as directly for builders and developers including Pulte Homes, Western Pacific Housing (now part of D.R. Horton), Playa Vista LLC and The Irvine Company. As a Marketing Research Manager for the Irvine Company, Heidi led a team of analysts to offer pricing recommendations for existing and future projects on the Irvine Ranch to use in various pro-formas critical for land sale negotiations, oversaw the in-house databases and provided all aspects of housing research (including both new construction and resale data) to the senior management team. Heidi also brings an extensive background in technology to each consulting assignment, having served as a Client and Industry Relations Manager for Cox Communications to create some of the country's first wired broadband communities -- including high-speed Internet access, digital telephone and digital television -- for the master-planned communities Ladera Ranch and Newport Coast. Each year in San Francisco since 1996 (and now also in New York City), a dedicated group of technologists, real estate pros and other industry leaders gather to discuss the most pressing issues impacting the business of real estate. Founded by Inman News Founder & Publisher Bradley Inman, the Real Estate Connect conference has steadily grown in both attendance and prominence, with Internet companies such as Yahoo!, Google, Zillow and Trulia now among its top exhibitors. It’s also the place where a network such as HGTV can promote their new website, called FrontDoor.com, and provides a unique opportunity for a company like Realogy – which owns the Century 21, Coldwell Banker and ERA brands – for a splashy announcement of its latest brokerage namesake, Better Homes & Gardens. Even Craig Newmark, founder of the eponymous Craigslist.com, was there to share his thoughts on his site (12 billion page views per month, most of which originate in the U.S.) and his site’s great success (listening to the constant input from users). The big theme at this year’s conference was the future of the ‘nomadic consumer.’ Given the convergence of emerging trends such as smart phones taking on complex tasks once relegated to personal computers, faster and improved wireless networks, and information being stored on a vast computing ‘cloud’ rather than on individual hard drives, the day when consumers, suppliers and subcontractors will increasingly drive around to new home communities and require instantaneous information will soon be here, with the spoils being accorded to those who prepare the best. Part of that preparation will be reconfiguring existing websites for an Internet that will be just as video-centric as television. Gradually, words and pictures will be replaced by instructive video to a generation that was not only weaned on it, but has adopted it as an art form for sites such as YouTube. Still, it will be the search for a new home itself that will require new and better tools for a buyer pool now just beginning to see the importance (and prudence) of becoming a fully informed consumer. I’d expect to see more companies jumping out of the shadows -- such as Zillow, Trulia and Redfin -- that force established players such as Realtor.com, Homescape or NewHomeSource to change their game plans not just once in awhile, but continuously in order to remain relevant. At the same time, some of these new entrants continue to hit some bumps along the road as they learn that technological expertise alone is a poor substitute for years in the real estate trenches. Addressing these issues will become even more important as the real estate listings business becomes a global enterprise. The housing industry is also a natural fit for social networks and blogging, since these often-unedited forums allow potential customers to make a human connection with a real person instead of a generic company website with the requisite disclosures in a 5-point font. Rather than listings remaining prisoners of the 900-plus separate MLS systems throughout the country, an individual with a page on ActiveRain (a popular social network for real estate) or their own blog can now include specific listings, foreclosures or even analytical tools so buyers don’t feel the need to surf to other sites to be informed. Although some currently popular blogs cheering on the housing bust may end up with short lives when the market revives, those dedicated to objectivity and intellectual honesty will continue to battle traditional newspapers and magazines for online attention. One side benefit of the current housing downturn will be changes for the rebound that not only benefit the consumer, but strengthen an industry that has been damaged by the short-term interests of certain mortgage brokers, real estate agents and, yes, also some homebuilders. Imagine how much easier business will be with a simpler and more transparent mortgage system in which products are fully explained to buyers. Envision a time when those who dispense advice on one of life’s most important purchases – a new home – are more closely regulated and disciplined. The resulting thinning of the real estate herd, many of whom only jumped in after seeing it as a get-rich-quick scheme, will eventually leave the real estate industry with a higher quality of sales executives and managers who can re-think the process of home sales in a world in which neither buyer nor seller has an information advantage. For the building industry veterans who recognize and embrace these new market realities, success will likely come sooner rather than later. In the early 1990s -- well before the days of Zillow -- I remember being at a house party overlooking San Diego Bay and someone remarking how much the house probably cost. I was so curious to find out the details, the next business day I ordered a report from a title company to find out now only what the buyer paid, but also the lot size, square footage and room count. Although I didn't go around blabbing the details, I always felt a bit guilty nosing around, so the appearance of Zillow.com on the scene has brought me great relief! In the movie, which is co-written by "Empire of Debt" co-author Addison Wiggin and directed by "Wordplay" filmmaker Patrick Creadon, Messrs. Walker and Bixby argue that unless the government alters its policies and spending habits, the U.S. will be in for a serious financial meltdown. We're going to have to re-impose tough budget controls -- tougher than the ones we had in the '90s -- because we're in worse shape. Secondly, we're going to have to reform Social Security, Medicare, and the entire health-care system. Thirdly, we're going to have to engage in comprehensive tax reform. And lastly, we're going to have to look at the base of the federal government, because it's grown very much out of shape. In the case of "The Inconvenient Truth," you had the penguins and the polar bears to help visualize the consequences. In ours, we're talking about human beings. Hopefully, people care about them, too." Labels: Comptroller General David Walker, national deficit, U.S. national debt, U.S.I.O.U. For the past year, apartment buildings have been one of the few bright spots in the real-estate industry as people forced out of the home-buying market by foreclosures or the credit crunch have turned to renting. Investors have been buoyed by the 1.5 million rental households that have entered the market in the past year, including buyers locked out of the for-sale housing market and those who defaulted on their mortgages. The one downside of the housing crisis for apartment owners has been the "shadow market," made up of unsold homes that owners have put on the rental market. The availability of credit from government-sponsored Fannie Mae and Freddie Mac has buoyed values and fueled new deals. Turbulence at the mortgage titans, which together with Ginnie Mae hold 35% of the mortgage debt on multifamily housing, riled apartment owners last month as investors worried about the fate of Fannie and Freddie. But those worries dissipated as the housing bill signed into law last month made the government's implied guarantee of Fannie and Freddie's $5.2 trillion in mortgage securities more explicit. Although I doubt you'll ever see this story cited by bloggers completely enamored of bad news, a story in The Economist concludes that certain housing fundamentals are actually improving. Say WHAT?! Finally, since home prices have dropped about 18% from their mid-2006 peak (based on the S&P/Case-Shiller composite of 20 cities) and incomes have steadily grown, homes are returning to more typical levels of affordability in some regions. Mr Case estimates that in Los Angeles, the ratio of home prices to annual income per person doubled from 2001-06 to 16, and has since fallen to 11. In Boston, it rose from nine to 12, and has since fallen back to nine. This has left both optimists and pessimists pinning hopes for a rebound on the federal government. Last month’s housing-rescue law offers up to $7,500 to first-time homebuyers, a feature that the NAHB has been heavily promoting. The law also made the government’s implicit backing of Fannie and Freddie explicit, if necessary by injecting capital into them. With the long-term trend towards higher energy prices, a major theme lately has been the death of the suburbs in favor of urban areas. In fact, on a global scale, cities are expected to continue increasing their percentage of overall population. Places like Moreno Valley retain two enormous advantages over traditional cities. They have lots of cheap, available land and a pool of workers keen to avoid the ever-lengthening commute to Los Angeles and Orange County. When it comes to attracting businesses, these two factors outweigh high petrol prices. The city of Ontario, which contains the Inland Empire’s main airport, already has more than two jobs for each home. Greg Devereaux, the city’s manager, reckons it will eventually have more than three. The ongoing decline in prices appears to be spurring sales. The number of homes sold picked up in July for the first year-over-year expansion since October 2005. All counties, save Los Angeles County, posted at least a 10% increase from July 2007. The biggest gainer was the region's foreclosure nucleus -- Riverside County -- where sales jumped 48.6%. Los Angeles County was the weak link for home sales. The region's biggest county posted an all-time July low of 6,592 sales, down 3.2% from a year ago. The median price, meanwhile, dropped 27% to $400,000. There's no question that it's the purchase of the foreclosures that are driving local sales. Foreclosure resales in July composed 43.6% of all transactions, DataQuick reported. The question now is, whether rising demand can counter the ongoing price descent. 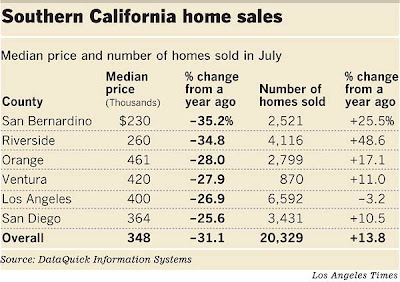 July's numbers show that, although still slow, the pace of Southern California home sales may have found a floor. Each calendar month from September 2007 through June was an all-time sales low, but last month's sales number, while still below the 20-year average, wasn't the worst showing for a July. Have the housing bust & credit crunch been overstated? The defining characteristic of this business and financial cycle has been a massive correction in the housing industry. That has had direct implications for that economic sector and financial stocks. The implications for the rest of the economy and other stocks, however, have been exaggerated. Briefing.com first addressed the implications of the housing implosion in a Sept. 25, 2006 Big Picture article titled "Housing: Correction or Crisis?" In that, we noted Fed studies that suggested an annual 10% decline in home prices would reduce GDP each year by about 0.25% due to the wealth impact on consumer spending. That is hardly dramatic, and is about in-line with what has occurred. There has not been a single quarter of a decline in consumer spending. Another feared implication of the housing crash has been that a credit crunch will result from the earnings and balance sheet problems at financial firms. Here the problem is partly compounded by imprecise language. There is a credit crisis on Wall Street. There is a lack of liquidity in the secondary market for mortgage-backed assets and many related securities. That is not the same, however as a credit crunch. A credit crunch is defined as a contraction in availability of credit as reflected in declining levels of loans. This has not happened. There is no doubt that lending standards have tightened. The quarterly Fed report makes that clear. But, it is illogical to assume that just because a majority of banks respond to a questionnaire by stating that they have tightened standards, that a credit crunch has developed. Banks are tightening standards from what had been extremely loose standards. And, they may be tightening standards for mortgage loans but not as much for C&I loans. Regardless of the surveys, the hard data show lending is continuing. The bottom line is that it is WRONG to say that there is a credit crunch. Nonfinancial companies have access to the credit they need to grow and manage their businesses. The housing crash has created an understandably negative tone which has adversely affected consumer and investment sentiment. On top of this, the spike in energy prices and the (mathematically modest) declines in payrolls have created an environment conducive to shrill journalistic claims of recession or worse. Yet, the fact remains that housing is the only major sector of the economy that has contracted. Consumer spending, business investment, exports, and government spending have each increased EVERY SINGLE QUARTER in the GDP data over the past year. The overall economic situation is of a major contraction in the housing sector that has not had significant ripple effects for other sectors of the economy, and shows no sign of doing so in the future. This disconnect from the reality of the limited implications of the housing crash and the fears associated with it creates investment opportunities. Longer-term, nonfinancial companies now present many good reward/risk scenarios. Stocks such as 3M, GE, IBM, and others reflect good values with good dividend yields. This is not to say that the market is a screaming "buy," but it is still our opinion that it would be wrong to panic on the fears that have been so prevalent through 2008, and that good, nonfinancial companies will deliver long-term value. Exposing the duplicity of lenders and municipalities in the downfall of home builders is the latest crusade for one Southern California-based builder that is fighting desperately to keep his own company afloat. But Pattinson isn’t twiddling his thumbs waiting for the housing market to rebound. He’s focusing more of his energies on calling attention to what he says have been two negative forces that crippled the housing industry: banks abandoning distressed builders, and municipalities squeezing builders for higher impact fees, which in his market can exceed $100,000 per house. So to force banks to “explain themselves” to lawmakers and the public, Barratt is working with the Homebuilders Coalition for Responsible Bank Behavior, a newly formed group that he says now involves 43 builders. Most are located in California, but the Coalition also includes builders from Oregon and Washington D.C. The group is developing a Web site, and plans to lobby in California and nationally. (It is close to hiring a public relations person.) Pattinson isn’t sure how much dust the Coalition can kick up, but he claims it’s already gained some traction with officials in Sacramento, California’s capitol. Lawmakers there are also weighing builders’ complaints about how municipalities have used residential development as their own piggy banks by imposing impact fees that, during the boom years, “got to the point where the housing industry wasn’t working anymore,” says Pattinson. He’s been railing for years against impact fees, which makes him the perfect choice to chair a fee reform task force that the California Building Industry Association recently formed. Pattinson is buoyed that several California towns have passed fee payment deferral statutes. And if towns start going bankrupt because the housing downturn is depriving them of fees to which they’ve grown accustomed, Pattinson expects more municipalities will be forced to consider weaning themselves from this revenue stream. The delinquency rate for prime mortgages worth less than $417,000 was 2.44% in May, compared with 1.38% a year earlier, according to LoanPerformance, a unit of First American (FAF, Fortune 500) CoreLogic that compiles and analyzes residential mortgage statistics. Delinquencies jumped even more for prime loans of more than $417,000, so-called jumbo loans. They rose to 4.03% of outstanding loans in May, compared with 1.11% a year earlier. The failure of prime mortgages will also make it more difficult for new borrowers to find affordable loans - and that will slow sales even more. Lending standards have been tightening for months, but if prime loans start to look risky, lenders will be even more conservative about who gets a mortgage. Consequently, prudent bottom-fishers looking to pounce when the time is right should definitely be taking steps to maximize credit scores (even if it means paying off an old debt with which you don't agree) and saving up a down payment of 10-20%. When home sales began to slow at the start of the downturn, home builders offered buyers incentives -- instead of reducing prices -- to stimulate demand. The incentives included cars, tuition and credit-card payments, and even cash. Now, federal investigators are questioning whether some of those incentives misled lenders and caused them to write mortgages that were artificially inflated, contributing to today's home-price crash... Housing analysts say incentive schemes prolonged the housing boom in hot markets like Las Vegas and, consequently, have made the downturn all the more severe. The FBI wouldn't name individuals or companies under scrutiny, but confirmed that it is looking at cases where the disclosures of incentives "haven't made it all the way to the ultimate lender," says William Stern, financial crimes supervisor for the FBI in Palm Beach County, Fla., and the bureau's former national mortgage-fraud coordinator. There aren't any strict limits on incentives, but they could run afoul of federal regulations if they cause the mortgage to increase by more than the cost of the incentive. "It's a phantom incentive to mask it in an excessive loan," says Brian Sullivan, a Department of Housing and Urban Development spokesman. Stronger due diligence by banks might have caught some of these problems. Banks, however, say they relied on professional appraisal companies to insure property pricing. Mortgage-fraud experts say appraisers sometimes cooperated with builders because it was the only way to get business. Appraisers say that determining the value of new homes is more difficult because comparable sales figures are provided by builders. In some cases, developers gave outsized commissions to real-estate agents who then gave that money back to the buyer. The average commission on a home sale nationally was 5.2% last year, up from 5% in 2005, according to a survey by Real Trends, an industry newsletter. At the height of the real-estate boom, commissions in Las Vegas regularly reached double digits, real-estate agents say. Kurt DeWinter, a Henderson, Nev., agent, received a $70,000 commission on a $550,000 home from Beazer Homes USA Inc. two years ago. He says he gave half of that to the buyer. I can't wait for the presidential debates to begin in earnest, because I'm eager to hear specifics from both candidates on numerous issues, including the economy. ...how much faith should voters put in the Arizona Republican's proposals? Or for that matter in Senator Barack Obama's bold plans to spend hundreds of billions on national health care, infrastructure, education, and energy? Put another way, how likely is it that the plans now being spelled out on the campaign trail will actually come to pass? In two words, not very. Politics, the weak economy, and the reality of the ballooning federal budget will all limit the next President's room for maneuver. McCain's low-tax strategy could well be chewed up in a Congress that is likely to be even more Democratic than it is today. Obama's lofty plans could be undone by the hefty costs of his health-care plan and other programs. Even some Democrats may not stomach the huge expense and vast complexity of Obama's proposals. The 2009 economy will offer tough conditions for a President set on bold new policies. The next Administration will face anemic growth, sluggish employment, a housing downturn expected to continue at least through much of next year, and continued tight credit markets as the shakeout works its way through the financial sector. Come January, the next President will have to take a much clearer stand as to where his priorities truly lie. The problem for voters is that it is impossible now to tell which of many competing goals Obama or McCain will back when the time comes to move from campaigning to governing. In either case, Americans will likely get much less than what's being offered in the heat of the campaign. In other words, it's time to start voting armed with knowledge about the reality of a candidate's positions instead of the gut check that's led to ruinous results in the past. The disappearance of seller-financed down payments, coupled with mounting foreclosures and a serious drain on available capital, pose a triple threat that could push considerably more private builders over the edge into bankruptcy by the end of this year. That's the bleak assessment of current market conditions that Tom Eggleston, the president and CEO of C.P. Morgan Communities, shared with other builders and investors during a conference call that JPMorgan hosted yesterday. Much of the call was devoted to the elimination of seller-funded down-payment assistance (DPA) in the recently passed federal housing bill, effective Oct. 1. More than 55 percent of C.P. Morgan's buyers need that assistance to purchase a house, Eggleston estimated. Michael Rehaut, JPMorgan's housing analyst, projected that its elimination could reduce the total number of new-home buyers by 17 percent. Possibly more problematic for builders will be the deadline Congress imposes on when homes purchased with DPA mortgages need to close. Eggleston speculated that this deadline could be as early as Nov. 1, which means that a buyer of virtually any home currently under construction would not be able to accept down-payment help from a seller or third party. The earlier the deadline, the greater the possibility that more purchase agreements will get canceled. Eggleston thinks that foreclosures could represent two-fifths of closings in many markets and might increase to half by the middle of next year. He also thinks no more than one-fifth of distressed homeowners will avoid foreclosure as a result of the housing legislation. He's more concerned, though, about accelerated demands by lenders for collateral reappraisals, which has led to a significant reduction in the value of assets that back the loans builders use to run their businesses. Eggleston expects lender demands to continue through the next year, which in his estimation will only put more companies on the brink of insolvency. Before the conference call, Eggleston was on record stating his belief that 80 percent of all private builders would be in workout with their banks by year's end. It's always wise for would-be home buyers to make sure that the builders they choose are on solid footing. But at a time when many companies are teetering on the brink of financial ruin, it's necessary to be as picky about the builder as the floor plans and options he offers. There already have been 35 "major" implosions and 27 "tiny" ones among the building community, according to the Home Builder Implode-o-Meter. And the website has 15 builders on its "ailing" watch list, including some of the biggest names in the business. The website's roll call of fallen firms is somewhat subjective because the companies on it may not have shut down operations altogether. Some have filed for bankruptcy protection, while others may still be running but have gone through some sort of adverse change. Whatever the case, when a builder becomes crippled, his buyers usually go down with him. Current customers often lose their deposit money or end up with a partially completed house. Recent buyers who have already moved in could be left with no one to come back to fix the numerous items that invariably require attention. For the entire list of suggestions, click here. One of the main reasons that I think economists can't seem to agree on how to value the appropriate price for housing is because they tend to take a 30,000-foot view, sort of what you might see when flying over an area. Then, taking out their magic pencils, they wave it over the area and proclaim that prices must fall by a certain amount in order to revert to a long-term relationship between prices and median incomes, or prices versus potential rents, or prices versus changes in interest rates. Of course real estate agents will tell you that since real estate is local that the 30,000-foot view is inherently flawed, thus giving us one more reason that no one can seem to agree on a home's value -- other than comps, of course, which of course only tell you what a home in the same area recently sold for and may or may not have anything to do with your house. One way to envision the bottom would be to look back at where prices were five or 10 years ago, before the current price run-up. There are some better ways, though. Noting that home prices have outpaced inflation in the past, one can calculate how much houses appreciated annually in the decades before the bubble, and then figure out how far out of line prices are now. Edward E. Leamer, director of the U.C.L.A. Anderson Forecast, has crunched these numbers for various regional markets. In Ocean City, N.J., for example, inflation-adjusted house prices rose about 1.6 percent a year from 1988 through 2002. Compared with what this rate would predict, the city’s houses in the first quarter of this year were overvalued by 51 percent. Over the previous year, they had fallen 0.6 percent; at this pace, Ocean City house prices will be at the right level in about 13 years. The model foretells eternal decline for some cities. It predicts that Kingston, N.Y., will not return to “normal” for almost four centuries. So that's not very helpful, is it? Many experts look to price-to-rent ratios to estimate where house prices should be in a region. Because renting is a direct alternative to buying, and because rents tend to be less volatile than prices, rents are often considered to be a good shorthand for figuring out the intrinsic value of a home. In the past decade, the price-to-rent ratio in many markets has exploded, indicating that people have been paying much more for their homes than the property is actually worth. From 1994 to 2002, for example, Phoenix had an average ratio of 11, according to data from Moody’s Economy.com. After peaking in the last quarter of 2002 at 22.5, it cooled to about 17.3 in the first quarter of this year. This measure is popular but problematic because some economists say many of the homes that people rent (apartments in multifamily buildings) may not be comparable to the types of homes that people buy (single-family houses). This is why looking at the local market is key -- that way you'd have a much better chance of finding a comparable property for rent. Any economist who would compare the cost of renting an apartment with the cost of owning a single-family home to argue for lower home prices should give back his PhD. Another ratio that housing economists watch is the ratio of home prices to per-capita income. This is telling because it shows whether Americans can actually afford the houses in their area. Some economists argue that the price to per-capita income ratio is misleading, because the price used in that model does not take into account the full cost for buyers. This full cost should include not just the price of the house but mortgage rates as well. He has put together, in a model that has not yet been published, a rough calculation of where house prices should be if mortgage markets were functioning the way they had been in the last few decades. This model shows that big-bubble cities like Miami and Phoenix were still overvalued in the range of 13 percent in May. It also found that San Francisco and Boston homes were corrected to the right level, and that homes were actually undervalued in New York by 5 percent. Still, Mr. Mayer says prices in these cities will probably continue to fall because of deteriorating mortgage markets and economic fundamentals. Yet another ratio worth watching is the relationship of housing inventory to sales. This measures the imbalance between supply and demand, which is the economist’s holy grail of market behavior. ...some experts argued that it was silly to try to build a mathematical model for the market’s overvaluation. Too much is unknown, they say, to make any predictions. My latest column for Builder & Developer magazine is now available online. This month's edition reviews the long-term impact of higher gas prices on suburban development, based partly on comparisons of annual increases in fuel prices vs. population growth in the Southwest Riverside County part of California, a long-time bedroom community for commuters working in San Diego County, Orange County and elsewhere in the Inland Empire. Ever since oil prices began their steep pricing rise earlier this year, we had pundits dismissing talk about overt speculation in oil futures for the increases. They pointed to static production, rising demand by emerging economies and political instability in countries with large oil exports, but they never really explained why a slow yet steady rise in demand would result in a spike in such a short time. People paid higher prices because they had little choice in the short run, but over time began to make adjustments that led to slowing demand that would eventually impact prices, but certainly not lead to the price drops we've seen in recent weeks. The market's conviction that oil prices were set on an unstoppable upswing was underpinned by a set of mantras to be chanted daily before breakfast by anyone hoping to make money by following the crowd: insatiable demand from China; indolent Opec sheikhs unwilling to open the supply taps; that nasty Vladimir Putin playing political hardball with Russia's oil and gas resources; those mad Iranian mullahs hell-bent on nuclear conflict; and beyond all these, the looming threat of "peak oil", the inevitable moment when Mother Earth's carbon-fuel gauge starts pointing towards empty. Now the psychological tide seems to be turning. On the supply side, Saudi Arabia, the dominant member of Opec, is now signalling greater willingness to open the oil taps. When the princes of the desert made a rather smaller gesture of willingness in that direction in June, the market took no notice and prices marched on. But in the new mood, any hint of an increase in Saudi supply is a reason to mark down prices. As for the Russians and the Iranians, the pundits have remembered that even the most externally truculent or internally turbulent of energy-exporting nations can feed its people at home only by selling its natural resources abroad, so must ultimately stay on good terms with its customers. And meanwhile, five years of rising oil prices have provoked a wave of investment in new drilling and refinery capacity - including the opening up of inaccessible oil sources that no one wanted to tackle when prices were low. Whether it is deep under the Arctic ice-cap or soaked into the tar-sands of northern Alberta, there turns out to be quite a lot more oil waiting to be exploited before we really approach the peak-oil apocalypse. More than that, high oil prices have encouraged rapid development of such alternative energy sources as wind and solar power, and more efficient engine and heating technologies. There is a long-running argument as to just what proportion of any commodity price movement can be traced to speculative activity by hedge funds and others, and what proportion to physical demand. But when the oil price swings up or down by $5 or more in a single day, you may be sure that the fluctuation is not being caused by a sheikh on one end of the line arguing with the manager of your local petrol station on the other: it is the financial parasites in between who are moving the market. Liz Pulliam Weston, who writes the "Money Talk" column for the L.A. Times, gave a renter some straight talk regarding how much money to spend on rent. Although her response might seem harsh, I think she has a point regarding renters who refuse to take on roommates and so are more likely to incur debt and not be ready for financial emergencies; in fact, of the friends I have with the worst finances, they're renters who insist on living alone even if it negatively impacts their savings rates, debt levels and credit ratings. I have read in your columns and elsewhere that people shouldn't spend more than 30% of their gross incomes on housing. But sky-high rent has become a sad reality for many people living in large cities. Even in the smaller city where I live, a one-bedroom apartment costs upward of $800 a month, not including utilities. The 30% rule is no longer true for many of us. I know my rent eats 45% of my monthly income, and I was lucky enough to find a half-decent place. If you spend more than 30% of your gross on housing, you're likely to have trouble making ends meet. You may not be able to save adequately for emergencies and retirement. You're more likely to go into debt. Only on television can young people with entry-paying jobs live in fabulous apartments in great neighborhoods. In reality, smart twentysomethings do what's required to keep housing costs down, including living in cheaper neighborhoods and sharing space with roommates. They get over their adolescent fantasies of what city living would be like and deal with the reality of making their budgets balance. SLAM!! In other words, "grow up." Makes me think about the time I got a roommate who secretly moved in two birds, a cat and a dog when I was out of town (before I evicted him), but at least he helped pay the rent! Emotions ran high today during D.R. Horton's fiscal third quarter conference call, as CEO Don Tomnitz spoke passionately to analysts about his company's performance, his feelings on the recently passed housing legislation, and management's stubborn commitment to spec building. The former CEOs of John Laing Homes and Warmington Homes are on deck to manage the assets of LandSource Communities through bankruptcy reorganization. The judge will hear the request on Aug. 19. His approval would make formal what has actually already started. HoganWebb LLC has been working since July 1, defining what services they would provide as restructuring officers. Under the proposed agreement, they would perform a financial review, help develop restructuring plans and other alternatives to maximize the value of the business, work as the main contact for financial and operational issues, as well as a variety of other tasks. For that first phase, the pair will be paid $120,000 a month. If the company fails to develop a reorganization plan by certain deadlines, the contract will kick into phase two and Webb and Hogan will become the sole members of the executive committee. For that they would be paid $170,000 a month. HoganWebb would be paid a $1 million bonus if the bankruptcy court confirms a reorganization plan on or before June 7, 2009. Hogan and Webb were selected after an extensive search because they are considered neutral, with no significant ties to either the debtor or creditors. The union, whose members were among the first hit by the recessionary effects of the housing downturn, protested builders' practices outside KB Home's Westwood headquarters today. On hand were several homeowners living in a KB development in Buckeye, Ariz., who said they are underwater -- owing more on their mortgages than their homes are currently worth -- and are facing foreclosure as their monthly payments ratchet higher and prices slide. The LIUNA has produced a report in conjunction with a new group called The Alliance for Homebuyer Justice -- which you can find here in .pdf format -- which uses homeowners in Arizona as an example of predatory lending between 2004 and 2006, with loans expected to rest through 2001 and unleashing yet another wave of defaults and foreclosures. Rather than merely paying lip service to preventing foreclosures, as Countrywide did, Bank of America must start actually doing it (i.e., loan modifications). Of course LIUNA also has its own agenda, to which it openly admits at the end of the report, including the right to organize unions, being paid a living wage, better training for workers, open access for homebuyers to affordable mortgages from independent sources and home prices that are targeted to what the community can afford.